← Donate and let go of items you no longer need to allow new things to come into your life. 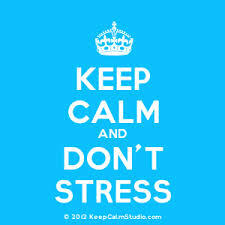 Stress is inevitable and we all have to deal with it someday or another. I am a junior in high school and there is not a single week that passes by without me feeling stressed out. From homework, tests and never ending essays to extracurricular activities. I am bound to feel stressed. Though it is unavoidable, there are still many ways one can deal with stress. I am going to share some of these with you, which I learned about from my experiences. 1. Learn to say “no” – One should always know how much work one can handle, whether it is in your personal or professional life. Don’t over book your week. If you know you have a lot going on, don’t commit to more things. If it is necessary to commit, then try and work out the other things you have committed to – maybe they can be done next week when you have more time on your hands? 2. Avoid people who stress you out – This may sound a little mean, but it’s true! I had this friend who would always be stressed out and worried before an exam, which made me even more stressed. I didn’t stop talking to her but I made sure not to be around her before any test. Work around it and try to avoid anyone who stresses you out. 3. Write it down – It is very important to write down what you have to do. Sometimes we just feel we have loads of work to do when we don’t. If it’s written down, you will know exactly what you need to finish and won’t be stressed out about forgetting to do something. 4. Express what you feel – This personally helps me a lot. If something is bothering you, definitely talk to someone about it. They might have a solution and help you feel less stressed. 5. Take time out and take breaks – In psychology class, we learned that taking 10 minute breaks during studying can really make you feel less stressed. I agree, because even a small break really relaxes you. Also make time to meet your friends or go out once a week. If you just focus on work, it will really stress you out and you won’t be able to get stuff done efficiently. These are just a few ways, which personally help me out a lot to deal with stress. I hope they are helpful for you as well, and if not you can always Google “ways to deal with stress” and find a solution which suits you.